I'm not sure if it's related, but often when I power on my BPi, with the Android image installed, it does not awaken and boot automatically. Sometimes no LEDs at all turn on, and sometimes the red LED just glimmers, but still without the BPi booting. But if I then take a match or a cut-off toothpick and use this to briefly press one of the tiny pushbuttons on the BPi circuit board, then the BPi boots properly, with Android working fine. Yours might be an entirely different problem, but it's something worth trying at least. You simply use Win32 Disk Imager for that one. 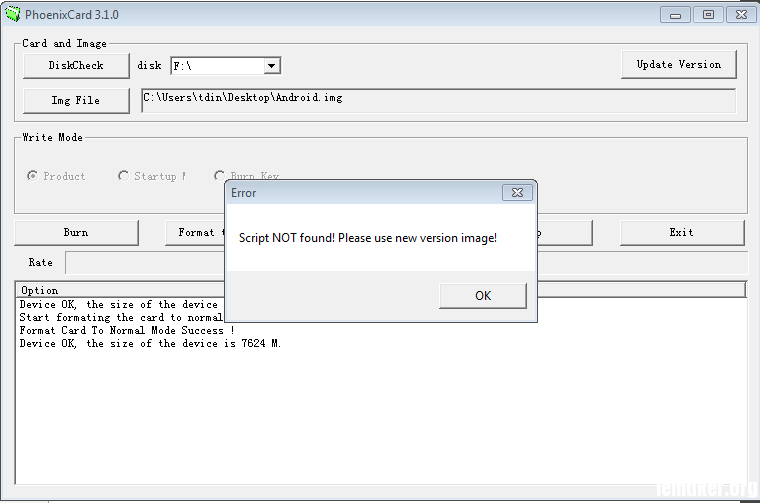 In the install directions linked on the same page, the use of 'Win32 Disk Imager' is said to be useful for all images except the android image, which is said to require PhoenixCard, just as for the old Lemaker image we've used. Also, if the image was made for use without PhoenixCard, wouldn't that also mean that it would be incompatible with DragonFace ? So in a way it might really be better if it does still require PhoenixCard (except for those having trouble making that work, of course). Either way, it would be very interesting to know how much this image differs from the ones we already have (your modded ones being the best so far of course ). I'm particularly interested in any improvements of device drivers for external USB devices, such as keyboards, gamepads and so on. Script not found. Please use new version image. Put write mode to startup! Yes, the startup mode should be selected before performing any operation on the card, and the "Format to normal" command is required before a "Burn". That's because the formatting needed is NOT any standard format you might have on the card before flashing Android, and the "Burn" command in this program does NOT handle the formatting. I don't think it even clears out old content of existing partions, if there is any. sooo.. an update and some notes for those that wish to attempt. 1st, you MUST use an external SD card reader for pheonix card - learned from another forum, 2nd, sometimes it says successfully burnt (30+ times) and still doesnt work. and lastly (this is the one that confuses me, but i'll deal) -- sometimes android doesnt want to start without a "console" TTL cable -- freshly installed android again, still wouldnt boot (and @dlanor i waited 15minutes each attempt). but i finally find the time to dig out the cable, connect it, get it monitoring, supply power and BOOM. boots IMMEDIATELLY, in like 20seconds... however the consoles going NUTS with info that im still sorting thru. more details as they become available, the good news is... IT WORKS! -- SPORATICALLY. I use pheonix card with my laptops internal SD card reader with no issues at all. @mattrix - these boot messages do not come on the HDMI/composite/etc and the HELLO! boot0 is normal from any SD boot when you have an SERIAL<->TTL connected. the huge mass of messages on starting android only happened the first full boot, i'm assuming that its android configuring and building its internals or similar.